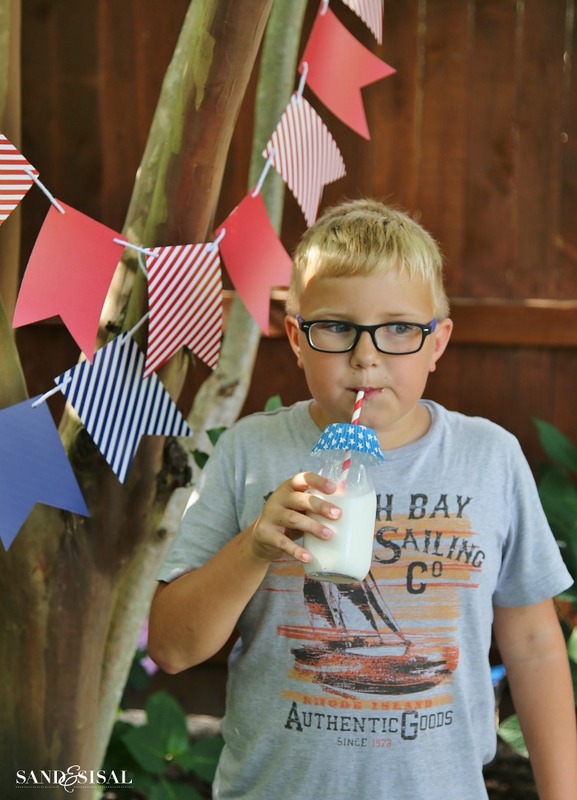 The 4th of July is quickly approaching (YAY!) and our family loves spending time in our backyard. Our back yard has been a 10+ year work in progress and I think it is finally coming together. 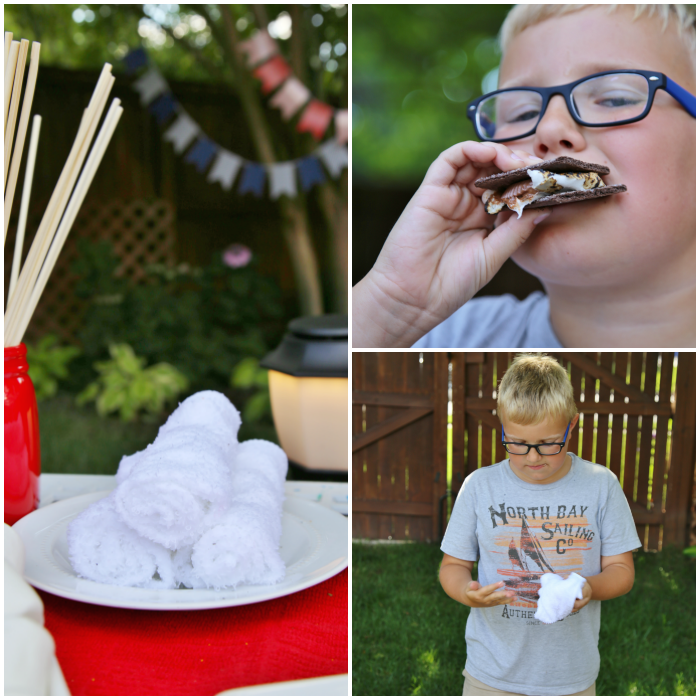 This week we had a fun S’mores Bar Summer Celebration! What is better than rich, sweet melty chocolate and gooey toasted marshmallow paired with crispy, buttery graham crackers? I made the mistake of telling my boys what I was planning for them… oh… my… gosh…. why do I not learn? Mom… mom… mom…. 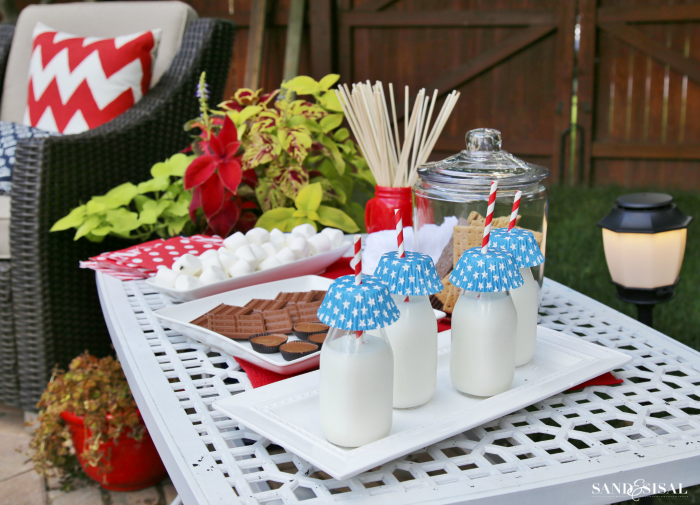 is it time for the s’mores bar party yet? Mom? We turned on our new Haven™ Backyard Lighting & Mosquito Repellent System to keep any critters from crashing our party. 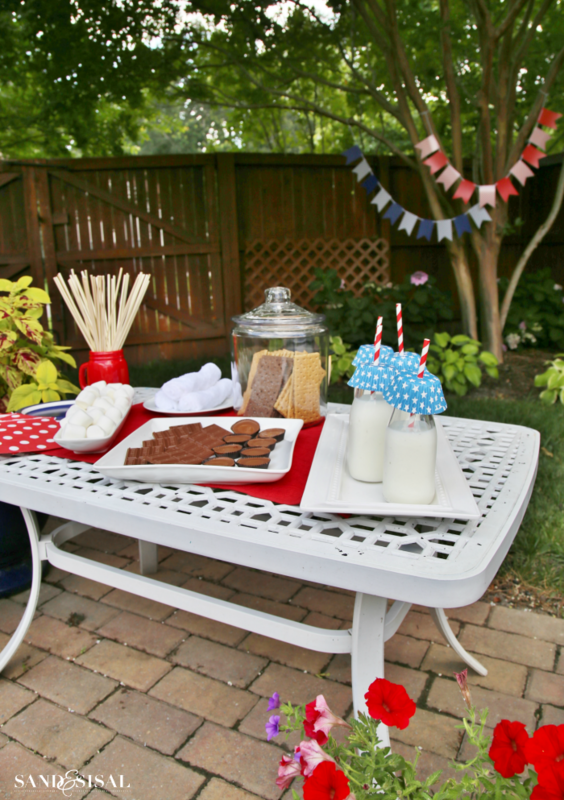 I prepared an adorable little outdoor coffee table filled with all the delicious s’mores goodies. 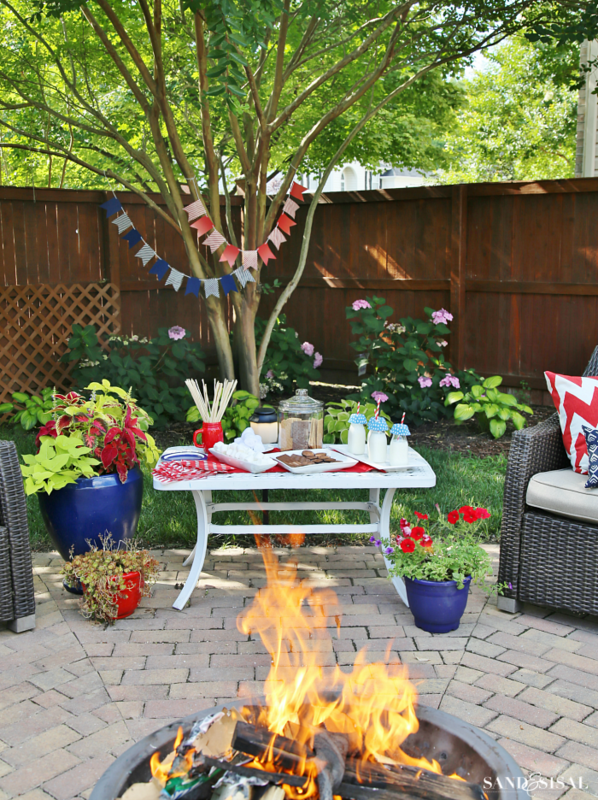 Here are a few tips I suggest for a successful s’mores party. 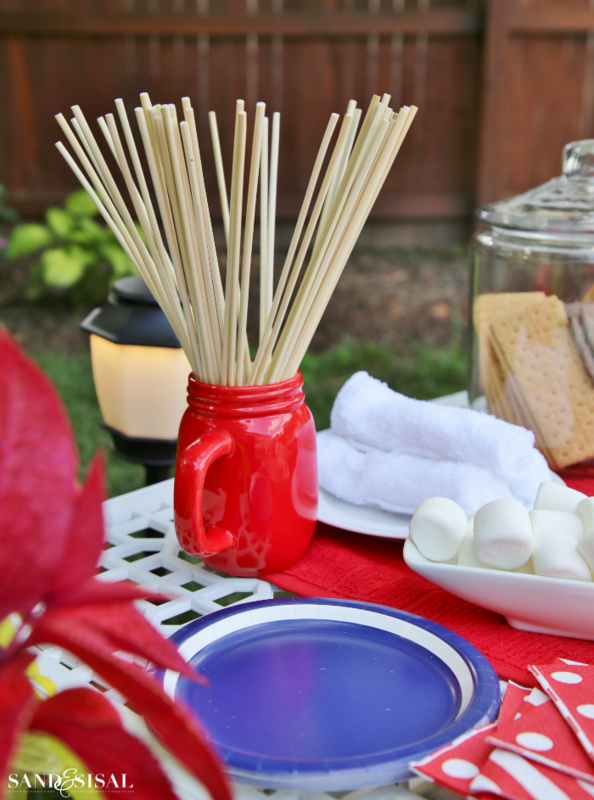 Soak skewers in water for about 30 minutes before the s’mores bar party begins. Display the skewers in a cute and colorful mug. 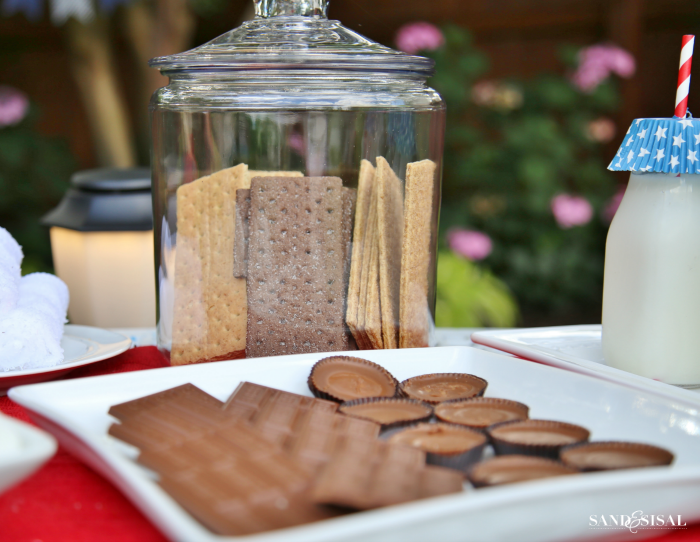 Think creatively when displaying your s’mores party ingredients. Graham crackers go stale and soft very quickly, especially in our southern humid environment, so keep them in a closed container like this glass storage jar with lid. Graham crackers are a given when making s’mores. Besides regular honey graham crackers, try chocolate graham crackers and cinnamon – sugar graham crackers for a fun gourmet twist. 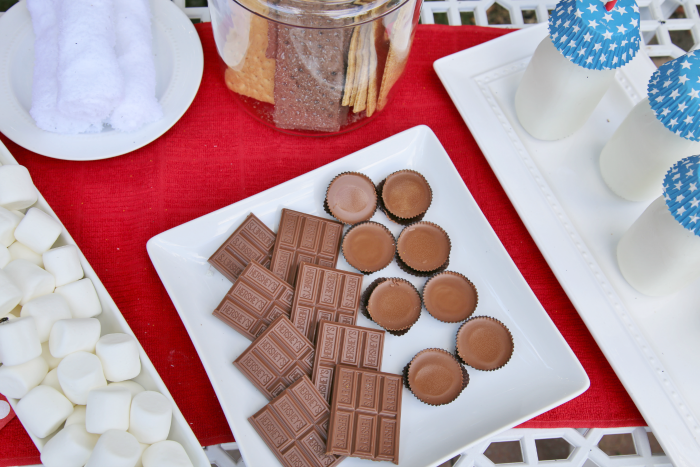 Make your s’mores bar even more fun with a variety of chocolate. We used Hershey’s Bars and Reese’s Peanut Butter Cups. You could also use Ghiradelli caramel filled chocolate bars, dark chocolate, white chocolate, or whatever you desire. 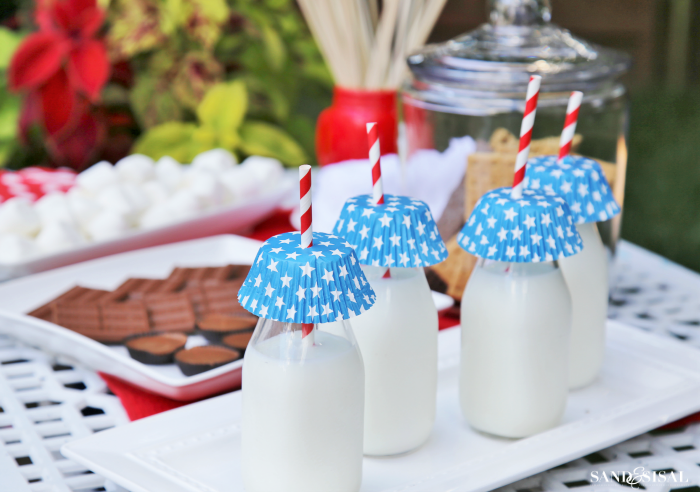 Nothing goes better with s’mores than icy cold milk in cute little milk bottles I found at Target. Are they not totally adorable or what? Keep any possible flying friends from sneaking in with upside down cupcake liners. 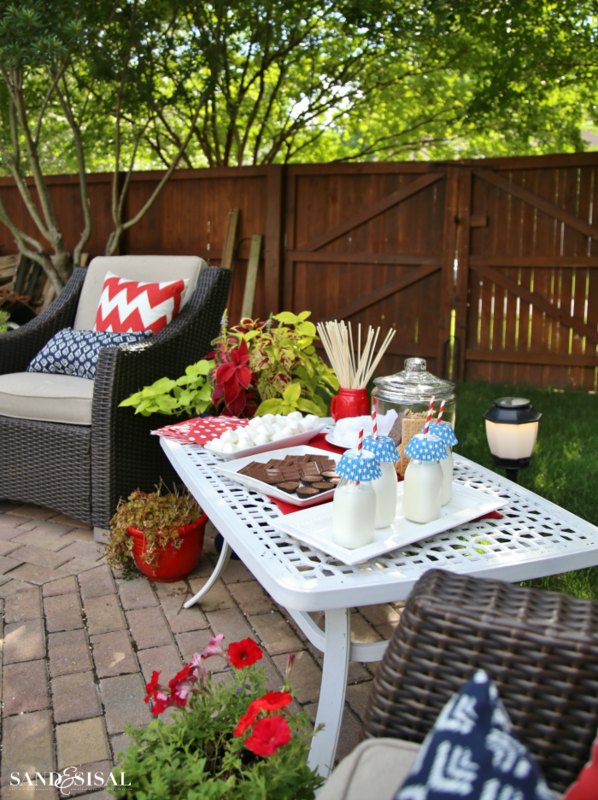 The best part of entertaining outside in our yard this summer is that no mosquitos or flies bother us! 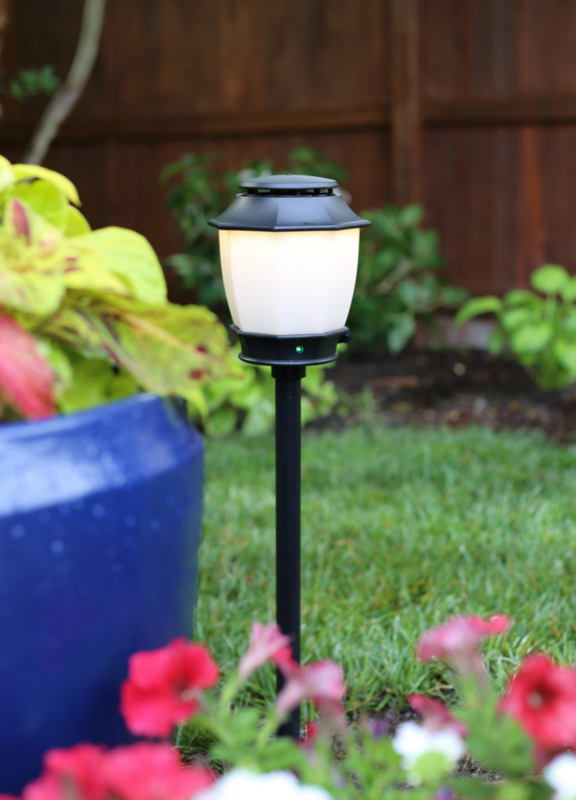 We are absolutely love our programmable Haven™ Backyard Lighting & Mosquito Repellent System, an odorless, invisible repellent system which is safe for people, pets and plants. See that little green light on the fixture below? That means mosquitos are high tailing it out of my yard! Learn more about how we installed it HERE. 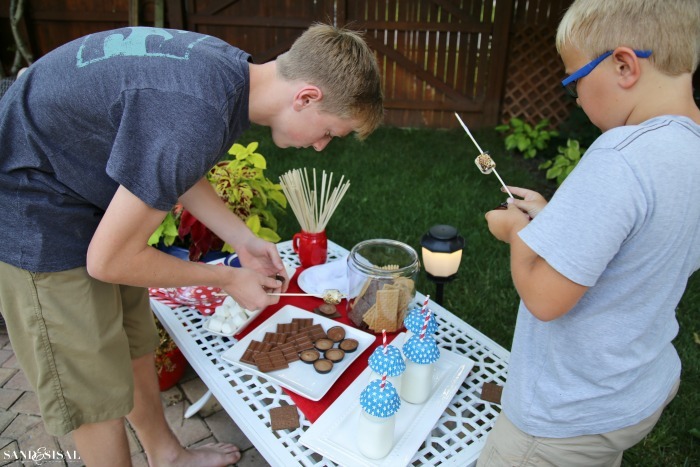 The boys loved making chocolate peanut butter s’mores made with chocolate graham crackers, Reeses Peanut Butter Cups, and marshmallow. It’s a chocolate peanut butter lover’s dream. Personally, my favorite is the classic s’more. 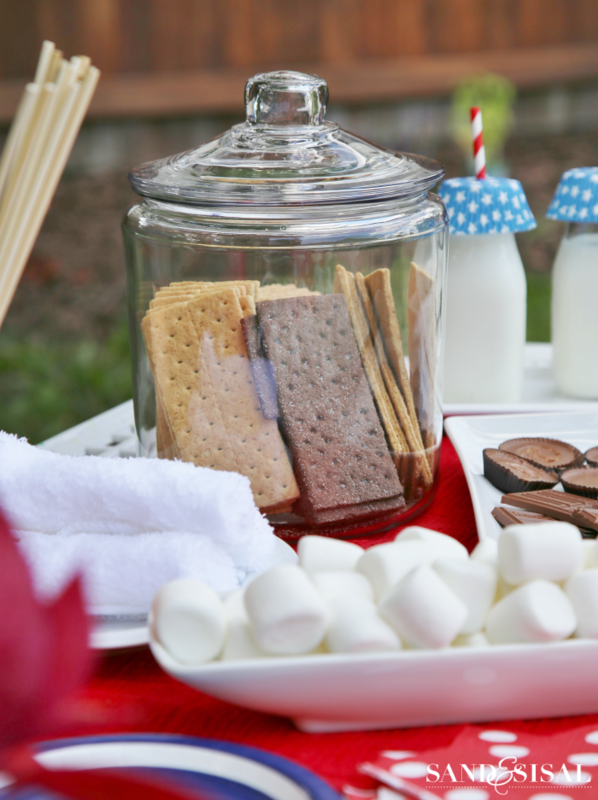 S’mores Bar Tip: Have a plate full of wet washclothes to wipe off all those sticky smiling faces and fingers. I hope you have a wonderful holiday weekend and fun this summer! 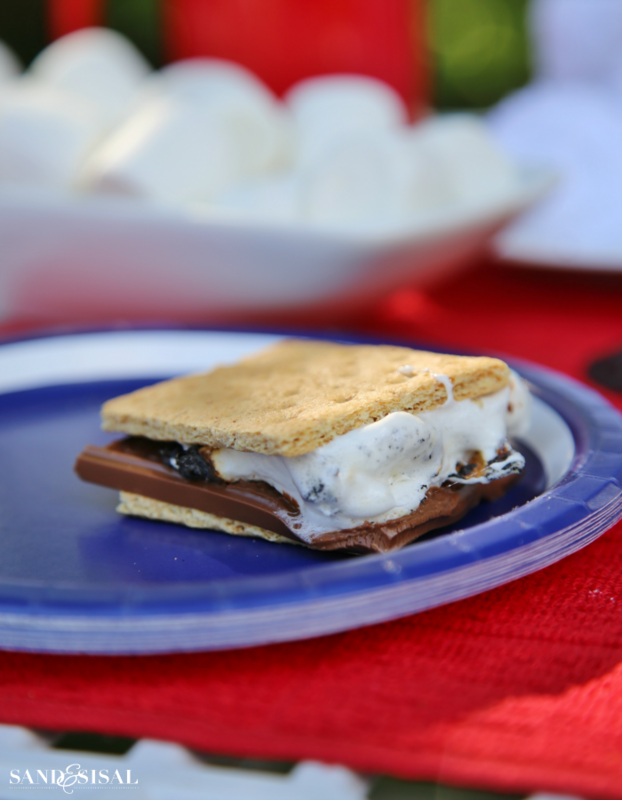 S’mores Cheer to you! Disclosure: This post has been brought to you in partnership with Haven Nutone. All opinions are my own. 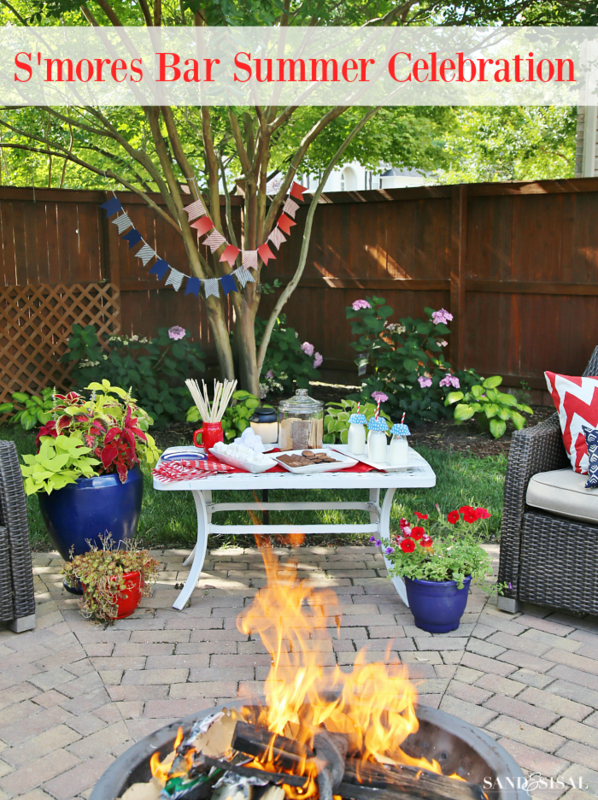 What a great backyard to host a family S’mores party! My mouth is watering right now for one of those yummy treats. 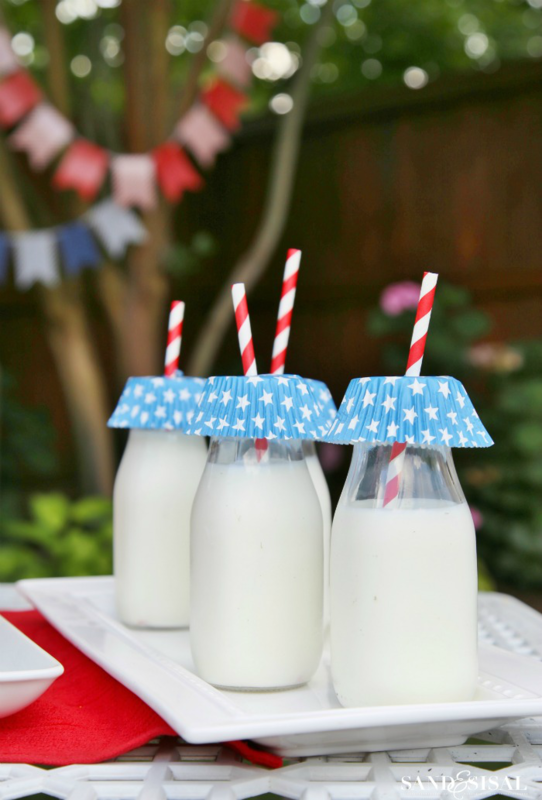 The milk bottles are adorable Kim, and what a clever idea on the cupcake liners to keep the bugs away. Have a happy and safe holiday weekend! 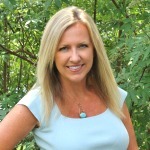 Thank you Nancie! It was so fun and yummy! Have a fabulous 4th too! Love this idea! Everything looks so cute! And I love the idea of using different kinds of graham crackers and/or chocolate! I always sub dark chocolate because I don’t love milk chocolate but the others sound great as well, especially the caramel ones! Mmmm! My fav is dark chocolate too! Thanks for stopping by Sheila! Have a great weekend! 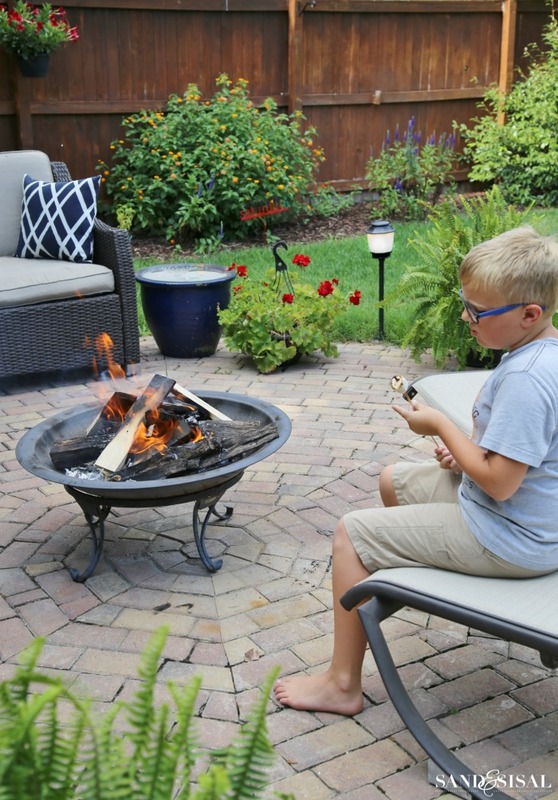 This looks like such fun – what a great way to enjoy summer and s’mores! !